In 1846 William Freeman was the first man in America to plead insanity as his defence. After an unfair imprisonment when he was 16, he was beaten so badly in jail that he stopped recognising his own mother. 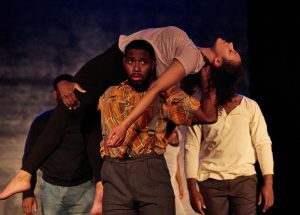 Strictly Arts’ Freeman takes his story and uses it as a jumping off point to bring to light injustices throughout history linked to mental health and racism. In 2005, Michael Bailey hanged himself in his jail cell after signs of mental illness were repeatedly played down and ignored. All officers involved in his case were cleared. The same year, Sandra Bland was stopped by traffic police for failing to signal a lane change. Her dashcam recorded evidence of racial violence against her; she was later found hanging in her cell. The names Trayvon Martin, Jordan Davis, Malissa Williams and Timothy Russell, Dontre Hamilton, and many more all scrambled together, are flashed up on a screen, accompanied by stun gun sound effects and a writhing cast, the words ‘I can’t breathe’ echoing above the chaos. ‘Nothing has changed’ is the refrain. Travelling back and forth through time, their stories are told – alongside Sarah Reed, David Oluwale and Daniel M’Naghten – interwoven with lilting choreography: a spirited 50s dancehall scene and an exaggerated chase making inventive use of shadow puppetry inject some lightness into these harrowing tales. However, depictions of sexual assault and suicide are pointedly jarring – we’re supposed to be horrified, we’re supposed to be shocked into taking notice. Freeman is dark, with no obvious hopeful conclusion except for raw, lyrical awareness. Until Mon 27 Aug (not 10), Pleasance Courtyard, 5pm, £10-£11 (£9-£10).